Bird Golf Schools’ mission statement is to deliver “the ultimate golf learning experience”® to their students and they take their mission very seriously. The core philosophy of their “Ultimate Golf Learning Experience”® is to tailor programs for each individual student and to provide students with one-on-one instruction. To implement this highly personalized approach, Bird Golf Schools has assembled a highly experienced staff that includes not only professionals with extensive teaching backgrounds, but Tour Winners as well; including winners of the U.S. Open, the World Pro Am at Pebble Beach, the Women’s Colorado Open, and the National Teaching Division Championship. Their golf school location at Crested Butte is one their most spectacular. This championship mountain golf course is an ideal setting for golf instruction. Designed by Robert Trent Jones II, The Club at Crested Butte is surrounded by pine and aspen forests and dramatic mountain peaks. Bird Golf school students enjoy the private practice facilities and all the sundry amenities available at the Club. In addition to the superb golf course, other Club amenities include tennis, aerobics and fitness center, indoor pool, full service Spa and Remi’s restaurant. 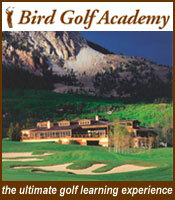 Bird Golf Academy students stay at Grand Lodge at Crested Butte. Just minutes away from the golf course, the Grand Lodge is the perfect place to unwind after your golf school day. Bird Golf students’ stay in a suite with a separate sitting room and enjoy views of the surrounding mountains. The Lodge features include the Wildflower Spa and the acclaimed WoodStone Grille. In addition to which, you are only minutes away from downtown Crested Butte where there are several dining options and an abundance of summer activities. Crested Butte is the perfect setting to “get away from it all” and immerse yourself in your golf school experience. Their golf school at Green Valley Ranch Golf Club is the ideal location for your Denver golf school. Rated a prestigious 4 stars by Golf Digest, you enjoy both 18-hole championship golf course and 9-hole superb par-3 course. Designed Perry Dye, the courses blend superbly with the Rocky Mountain landscape and are surround by stunning views. The spectacular practice facility features a panoramic range area and extensive chipping and putting greens to work on your skills. Their hotel partner is at the nearby Hyatt Place with immaculately appointed guest rooms. Whether you’re a low handicap player looking to master your short game or a total beginner who wants to learn the fundamentals, Bird Golf’s exceptional teaching staff can help you meet your objectives. The school offers twenty spectacular Resort locations in Arizona, California, Colorado, Georgia, Florida, Minnesota, Nevada, New Jersey, North Carolina, South Carolina, Tennessee. Enroll in Nike Golf Camp in Englewood, CO and get better this summer! Experienced Nike Camp Director, Brad Neher, is poised to help all junior golfers improve their games in a fun and positive learning environment this summer.